The lungs are a pair of organs which are located in the thorax and are responsible for oxygenating the blood and removing carbon dioxide from the blood. The process by which air is moved in and out of the lungs is colloquially known as breathing. It may be more technically refered to as respiration, although this term is also applied to the entire process by which an organism utilises oxygen for the transduction of energy. Ventilation is also sometimes used to describe breathing but may be reserved for situations in which a patient's breathing is mechanically assisted. The lungs occupy much of the thoracic cavity and are situated on either side of the mediastinum. Their anterior borders overlap the heart. The top of the lung is known as the apex. Located at the middle of the medial surface of the lung is the hilum. The pulmonary arteries and main bronchi enter the lungs at the hila while the pulmonary veins leave the lungs. Each lung is divided into lobes. The right lung has three lobes, an upper, middle and lower. The upper lobe is separated from the lower by the oblique fissure. The middle lobe is separated from the upper lobe by the horizontal fissure and the lower lobe by part of the oblique fissure. The left lung possesses only two lobes, the upper and lower; these are divided by the oblique fissure. The heart occupies the space where the middle lobe would have been; some sources assert the left lung has a small 'lobelet', the lingula, which projects from the upper lobe and in effect would have been the left middle lobe if circumstances had allowed. 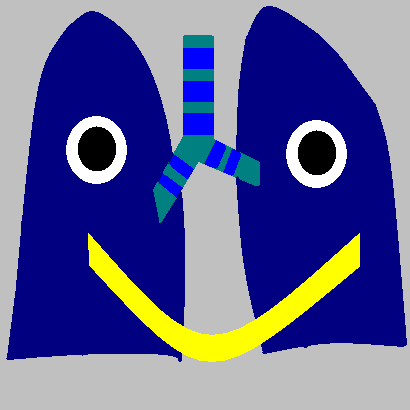 The left lung is therefore smaller than the right. The lobes are fairly self contained, independent units. Their blood supply and airways can be surgically isolated separately from the other lobes. Air reaches the lungs via the mouth and nostrils (via the oral cavity then oropharynx and the nasal cavity and nasopharynx respectively), then the larynx and the trachea. The trachea is a hollow, tubular organ which is lined by ciliated columnar epithelium. The wall of the trachea is reinforced with incomplete rings of cartilage. These rings have a gap in the posterior aspect that allows the trachea to be deformed inwards slightly if a large food bolus passes down the adjacent oesophagus. The trachea branches into two principal bronchi. 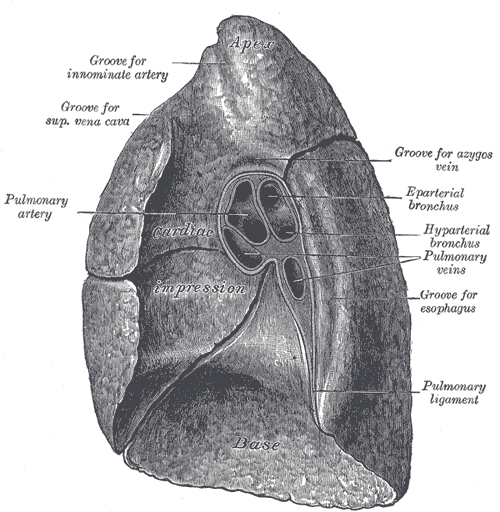 These enter the lung at the hilum and divide into the lobar bronchi; each lobe has one lobar bronchus and thus the right lung possesses three lobar bronchi and the left lung has two. The bronchi have cartilage rings but they are not as well developed as those of the trachea. 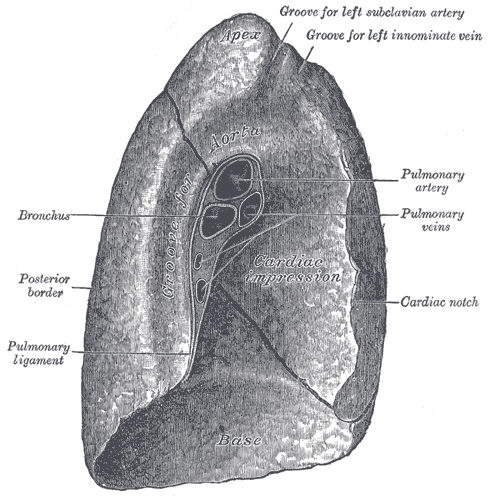 The lobar bronchi divide into segmental bronchi. These supply the bronchopulmonary segments which are volumes of lung which have a blood and airway supply that is fairly well delineated from the other segments and can therefore theoretically be surgically isolated. 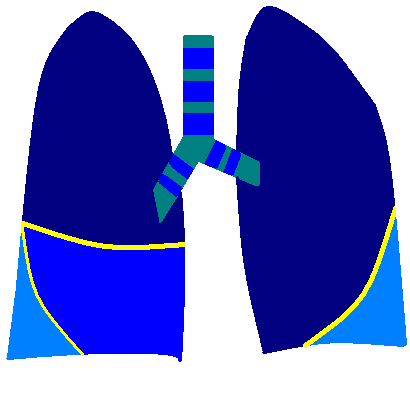 The right lung has ten segments and the left lung possesses nine. The segmental bronchi divide into primary bronchioles which in turn branch into terminal bronchioles which themselves divide into respiratory bronchioles. Approximately twenty divisions occur between the bifurcation of the trachea and the respiratory bronchioles. The bronchi and proximal part of the primary bronchioles are lined by pseudostratified ciliated columnar mucosa. From the distal primary bronchioles on the epithelium is cuboidal. The bronchi and proximal primary bronchioles also have admixed mucin producing goblet cells in the epithelium. The underlying wall contains smooth muscle which can constrict the lumen of the airway. The distal airways feature Clara cells in their epithelium. Clara cells secrete a liquid which contains surfacant, lysozyme and other proteins and coats the inside of the distal airways. They are also able to detoxify some inhaled harmful agents. Each respiratory bronchiole splits into around two to ten sac-like alveoli. 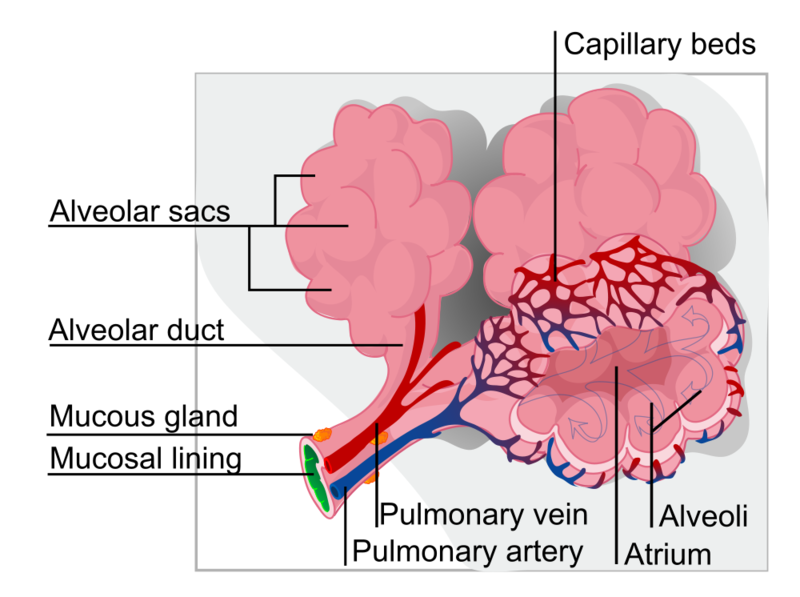 The alveoli are the site of gas exchange between the air in the lungs and the blood in the pulmonary capillary network. There are roughly 600 million alveoli in the two lungs. The alveoli are lined by flat, squamous cells (type one pneumocytes) which account for around 95% of the surface area of the alveolus. Gaseous diffusion occurs across the surface area provided by these cells. The remaining 5% of the surface area is contributed by the cuboidal type two pneumocytes. These cells secrete surfactant, a liquid that lowers the surface tension of the alveoli and reduces the force which must be applied to the alveoli to distend them. Arteriolar branches of the pulmonary artery ramify into a dense network of capillaries on the outside of the alveoli. It has been suggested that the density of this network is sufficient to equate to a sheet of blood flowing over the outer surface of the alveoli. The inhalation of small particles and bacteria into the lungs is unavoidable. 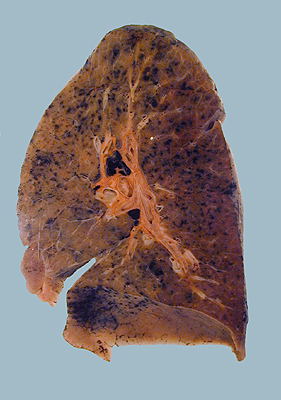 The lung requires systems for removing these unwanted intruders. The mucociliary escalator is the means by which this is accomplished. Goblet cells in the more proximal airways secrete mucus in which inhaled foreign material can be trapped. The cilia of the columnar cells beat in a co-ordinated fashion which propels this mucus back up the bronchi and the trachea to the top of the trachea where it can enter the oesophagus and be swallowed. Destructive gastric acid awaits this swallowed mucus and its contents shortly after. Coughing is a forceful way of expelling material from the lungs. The lungs have a dual blood supply. The pulmonary artery delivers deoxygenated blood from the right ventricle to the lungs for the purpose of gas transfer. However, the lungs also receive a second blood supply from the bronchial arteries. The bronchial arteries are part of the systemic circulation and carry oxygenated blood. The pleura is a double layered membrane which lines the inside of the thoracic cavity. The inner layer is the visceral pleura and covers the lungs. The outer layer is the parietal pleura and is attached to the inside of the chest wall. The space between the two layers is the pleural cavity. The right and left pleural cavities are separate and do not communicate. The pleural cavity normal contains only a few millilitres of fluid but can become expanded by the accumulation of liquid (pleural effusion), air (pneumothorax) or blood (haemothorax) to contain over two litres of fluid. If a pleural effusion, pneumothorax or haemothorax develops the lung on that side will collapse by a similar volume. The outer layer of the pleura is extremely sensitive to pain. The pleura is lined by mesothelial cells and is the most common site at which a mesothelioma can develop (others include the peritoneum and the pericardium). The function of the pleura is to allow the lungs to expand smoothly and relative to adjacent structures. Breathing is the process of moving air in and out of the lungs and is vital to allow carbon dioxide to be expelled from the lungs and oxygen to be replenished. The basic drive for breathing in humans is involuntary and cannot be overriden for more than a couple of minutes before automatic mechanisms compel a breath to be taken. However, within the limits of this respiratory drive breathing can be modified, for example in speaking, or temporarily paused in breath holding. Animals such as dolphins are voluntary breathers and have to make a conscious decision to breathe (this impacts on the way in which dolphins sleep). Breathing is a mechanical process which relies on the generation of a negative pressure, relative to atmosphere pressure, inside the thoracic cavity. This is accomplised by expanding the volume of the thoracic cavity. The diaphragm and intercostal muscles are integral to this process of breathing in (inspiration). The diaphragm is a broad, dome-shaped sheet of skeletal muscle which forms the floor of the thoracic cavity. It is attached to the posterior aspect of the xiphoid process of the sternum, the lower borders of the last six ribs and their costal cartilages and by two crura to the vertebral column. The right crus is attached to the first three lumbar vertebra and the left crus is attached to the first two lumbar vertebra. The central portion of the diaphragm is fibrous tissue (an aponeurosis) that is known as the central tendon. 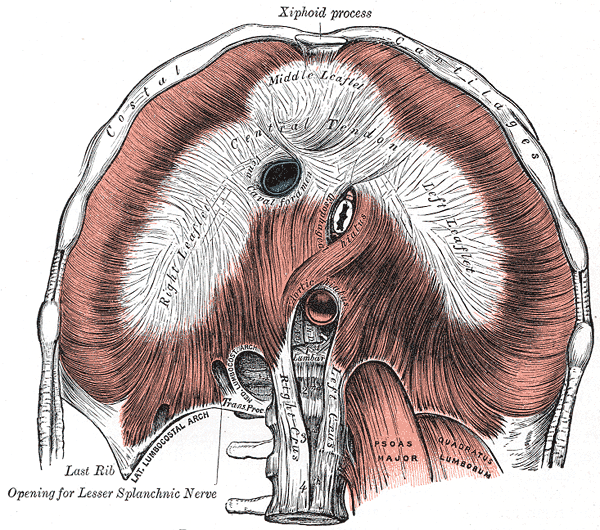 The diaphragm has three main openings in it to allow structures to pass through it. The motor innervation of the diaphragm is supplied by the phrenic nerve, the roots of which are the third, fourth and fifth cervical nerve roots. Contraction of the diaphragm pulls the central tendon down, thus flattening the diaphragm and increasing the vertical dimension of the thorax. Although primarily required for breathing, this action can also be used to serve other functions. The descent of the dome of the diaphragm raises intra-abdominal pressure and this can assist in defaecation, micturition and parturition. This increase in intra-abdominal pressure also helps in lifting heavy objects because it can contribute to stabilising the vertebral column; this process requires a forceful, sustained contraction of the diaphragm. By contrast, the normal contraction of the diaphragm helps to force blood along the inferior vena cava and back to the heart by creating a pressure gradient between the abdominal cavity and the thoracic cavity. The intercostal muscles run between the lower border of one rib and the upper border of the rib below. The external intercostal muscles run forwards and downwards. They extend from the tubercule of the rib (close to the vertebral column) around to the junction of the rib with the costal cartilage. The internal intercostal muscles run backwards and downwards. They are attached to the sternum in front and extend back to the angle of the rib. Both sets of intercostal muscles are innervated by the intercostal nerves, which are branches of the thoracic nerve roots. The usual effect of contraction of the intercostal muscles is to swing the ribs upwards and forwards. This increases both the anteroposterior and transverse diameters of the thorax (the bucket handle action). In order for this to occur the first rib needs to be anchored. This is achieved by the contraction of various neck muscles. In deep and/or forceful expiration many additional muscles are called into play to assist in this process. These are the accessory muscles of respiration and usually relate to the neck or the upper limb girdle. Their employment explains why patients struggling for breath may sometimes brace their arms in order to stabilise those limbs and allow the relevant muscles to move the chest wall. Although inspiration is an active process, expiration is typically a more passive event. The inspiratory muscles relax and the elasticity of the lungs and chest wall returns the thoracic cavity to its smaller volume, thereby raising the pressure and forcing air out of the lungs. If a deeper expiratory effort is required the muscles of the anterior abdominal wall contract. The centres that govern the involuntary respiratory drive are located in the medulla oblongata of the brainstem. These respiratory centres ensure that respiration takes place involuntarily and modify the respiratory rate according to the body's needs. Increased physical activity requires an elevation of the respiratory rate in order to provide an increased supply of oxygen and to increase the clearance of carbon dioxide. This increase can be provided by breathing more quickly and/or more deeply. The respiratory centres in the medulla oblongata can integrate information from other areas of the brain, as well as responding to circulating adrenaline, to augment respiration accordingly on the basis of an awareness of greater muscle activity. However, the respiratory system is also equipped with monitoring sensors which evaluate the central aspect of lung function, the levels of oxygen and carbon dioxide in the blood. The peripheral chemoreceptors are specialised structures that are located in the carotid body at the bifurcation of the common carotid artery and in the aortic arch. They are sensitive to the levels of oyxgen and carbon dioxide in the blood. A fall in the blood oxygen content will stimulate the chemosensors and this signal will be integrated by the respiratory centres to produce an increase in respiration. A rise in blood carbon dioxide will also stimulate the chemosensors and increase respiration. The central chemoreceptors are sensitive only to carbon dioxide and are found on the anterior surface of the medulla oblongata. If they detect an increase in carbon dioxide in the cerebrospinal fluid (which is in equilibrium with carbon dioxide in the blood), they trigger an increase in respiration. Of the two factors, hypercapnia (an elevated carbon dixode level) is a more powerful stimulus than hypoxia (a low oxygen level). Carbon dioxide and blood pH are intimately related. The pH of the blood is very tightly regulated (7.35 - 7.45). The connection between carbon dioxide and acid exists through the equilibrium of carbonic acid. Carbon dioxide and water can combine to form carbonic acid, which can dissociate into hydrogen ions (acid) and bicarbonate (base buffer) and vice versa. By the chemical equilibrium of the system a fall in blood pH (due to a rise in the concentration of hydrogen ions) will force the equation to the right and yield more carbon dioxide. Similarly, if the respiratory rate is increased this can remove carbon dioxide and pull the equation to the right, thus forming a rapid way to restore blood pH, albeit at the expense of bicarbonate (the kidney also regulates the acid-base status of the body and is more sophisticated in its mechanisms but cannot operate as quickly as the lungs, which can hyperventilate off carbon dioxide rapidly). Physical exertion causes an accumulation of lactic acid as a consequence of anaerobic metabolism by skeletal muscles. Disposing of this acid by blowing off carbon dioxide is one of the drives for increased respiration during exercise and also for the need to continue breathing more quickly and deeply afterwards because the body has to finish clearing the lactic acid. Several different terms are used to describe different aspects of lung function and relate to the volumes of gas processed by the lungs and airways. Residual volume The residual volume is the amount of air that is left in the lungs no matter how forcefully somebody breathes. It is around 1.2L. Tidal volume Tidal volume is the amount of air that moves in and out of the lungs with each breath under normal, resting circumstances. Its value is 0.5L (500ml). Vital capacity The vital capacity is the maximum volume of air that can be moved in and out of the lungs by taking the deepest possible breath in and then breathing out as forcefully and completely as possible (down to the residual volume). It is sometimes known as the forced vital capacity (FVC). The vital capacity is in the region of 4.5-5L for men and 3-3.5L for women. Forced expiratory volume The forced expiratory volume in one second (FEV 1) is the maximum amount of air that can be forcibly expelled from the lungs in the first second of forced expiration. FEV1/FVC The ratio of the forced expiratory volume in one second to the forced vital capacity is a very important parameter of lung function. It should be at least 80%. Dead Space Dead space is the volume of the airways that cannot participate in gas exchange but which has to be moved in order to ventilate the lungs. It is normally composed of the trachea, bronchi, larynx, pharynx, oral cavity and nasal cavity. Peak expiratory flow rate The peak expiratory flow rate (PEFR) is the highest rate of flow of air that can be achieved during forced expiration. Its value depends upon height and gender but normal values are measured in terms of hundreds of litres per minute. Measurement of the PEFR is a valuable tool in the management of asthma. Diffusion capacity The diffusion capacity is not a measure of volume or flow rate but is a measure of the efficiency of gas transfer. It is actually determined using carbon monoxide as the gas for which the diffusion is assessed (only tiny quantities of carbon monoxide are employed).